Apple co-founder Steve Wozniak proclaims his praises on Android, and wishes Apple could do what Android can do in features such as voice command and built-in navigation. This, however, does not mean he has turned his back on Apple. “Woz says he still thinks Apple’s iPhone is the best overall smartphone, but he says there are ways in which Android has leapt ahead of Apple,” reports Dan Lyons at www.thedailybeast.com. "I used to ask Siri, 'What are the five biggest lakes in California?' and it would come back with the answer. Now it just misses. It gives me real estate listings. I used to ask, 'What are the prime numbers greater than 87?' and it would answer. Now instead of getting prime numbers, I get listings for prime rib, or prime real estate," said Wozniak. 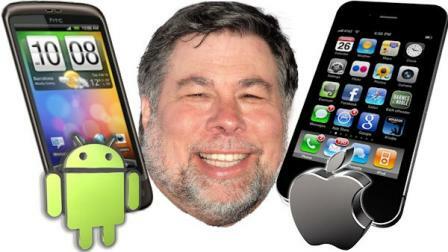 In some ways, Wozniak and I have similar thoughts and opinions on Apple and Android. While Jobs’ Apple is easier to use, Android was able to build more capabilities and features due to its availability to many different hardware makers. Maybe we can call it selfish, but Apple has always created a wall that blocks other manufacturers or developers from gatecrashing into its hardware. For consumers and mobile users, the perspective is placed on the quantity and variety of applications available, which is a huge number as compared to Android. However, when we put the light onto the application developers, most of them would comment that Apple’s bureaucratic approval process slows them down in one way or another. On the contrary, Android developers get to create and release the programs in a shorter time. Once they do, feedback would come in and the live environment experience would tell them to immediately start working on the app’s improvements, tweaks, and updates. This might hugely be the reason why Android’s applications are quickly growing in number in such a short span of time. Unlike Steve Jobs who hated Android operating system so much that he even vowed to destroy it until his last breath, I admire Steve Wozniak for having an open mind to use and give commendations to his first love’s competitor. Strange as it may be that the major leader of the Mac followers has given adoration to Android, but it’s good for Apple to realize that Android can be a reason of their downfall, especially that the observations came from their own camp’s patron saint. I do hope that Apple fans will be Wozniak’s who won’t always dismiss other operating systems and hardware as copycats or dying technologies. At the end of it all, we should get the phone and use the operating system that works for us – not what works for the majority of people around us. This article is my 48th contribution to Manila Bulletin -- one of the Philippines' leading broadsheets -- published on January 23, 2012 (Monday) in the TechNews Section. You can view the PDF version here (lower left portion). Apple co-founder Steve Wozniak is such a good sports. True. Competitors should somehow complement each other, so they'd know what to improve. But then, others can be selfish. I haven't tried android, been using iPhone for so long... Yah I'm an avid fan of apple... But my mind is not closed, I will be willing to try android too. It's a good thing Steve is a good sports, healthy competition is always the best.